Allen flew in tonight for Photoshop World and I just picked him up and we drove directly to our favorite restaurant in Las Vegas... 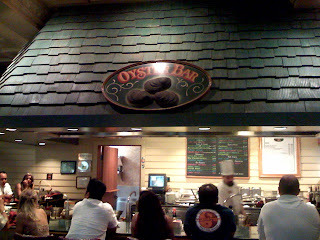 The Oyster Bar. Since I have nothing better to do right now, I'm blogging. We've been waiting for more than 45 minutes and it's worth the wait. Everyone waits at the Oyster Bar. The food is awesome. Their famous panroast is to die for. They cook right in front of you while you sit at the counter. You'll be salavating by the time you sit down because you've been waiting for the past hour and smelling the aroma. It's torturous but we love it! Oh by the way, did I tell you the price is very reasonable. It's definitely a must if you ever in Las Vegas.